Company president, James “Jimmy” Sands made the official announcement during a press conference at the Ministry for Grand Bahama 6 February. Minister for Grand Bahama Dr Michael Darville said he was delighted with the news and pointed out that construction is well underway for the additional storage facility at the Queen’s Highway-based plant. He noted that the company first opened its doors in 2007 with just 14 employees and an initial investment of some $15 million. 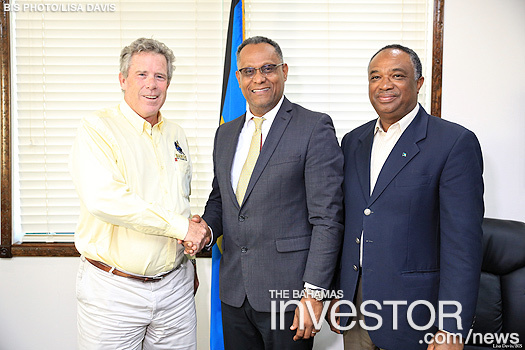 “Today marks an exciting one in the history of the Bahamian brewery which to-date, remains a 100 per cent Bahamian-owned and operated company, as it is now set to invest another $2 million to expand the warehousing capacity of their business here in Grand Bahama,” Darville added. The Minister further remarked that the expansion is yet another sign of the strong investor confidence in both the government’s policies as well as the local economy on Grand Bahama. Sands indicated that his company will continue with its upgrades as needed in Grand Bahama.